If you used document-based databases such as MongoDb or RavenDb then this is straightforward. If not, then I have an introductory course on MongoDb with .NET starting here. Skim through the first couple of posts there to get the basic idea. As Amazon Web Services has a solution for all imaginable software engineering problem – well, almost all of them – it’s no surprise that they have a NoSql database as well. Their NoSql database is called DynamoDb. It is a fast, scalable and efficient NoSql storage that can act as the data store of any application type that can communicate through HTTP. Amazon have prepared a wide range of SDKs and .NET is no exception. Therefore any .NET application will be able to communicate with DynamoDb: creating and querying tables, adding, deleting and updating records will be straightforward. The home page includes a lot of marketing stuff but there’s a lot documentation available for developers as well starting here. Beware that most examples are available in Java. This series is the 3rd installment of a larger set of series based around Big Data in Amazon Cloud. Previously we discussed the message handler solution called Amazon Kinesis and an efficient blob storage mechanism called S3. The whole purpose of the set of series – or series of series – is to go through the basics of a Big Data system in Amazon cloud. At the same time, each ingredient in the series should be straightforward to follow for those who are not interested in Big Data, but only in the Amazon component itself. This sub-series is no different. If you only want to learn about DynamoDb then you can follow through without worrying much about what we discussed before. If, on the other hand, you’re building a Big Data handling system then we’ll see towards the end of the series where DynamoDb could fit into the picture. We’ll pave the way for the next Amazon Big Data component called Elastic MapReduce (EMR), a Hadoop-based data mining solution. In fact, I was a bit uncertain whether I should describe EMR first and then go over to DynamoDb, but showing DynamoDb first should be fine. Note that in your case a different region might be pre-selected so don’t get confused by the fact that it says “Singapore” in the above screenshot. Click the down-pointing arrow to view all the available regions. These regions are significant for all services with a couple of exceptions. E.g. S3, which we discussed in the previous series, is global and has less regional significance. 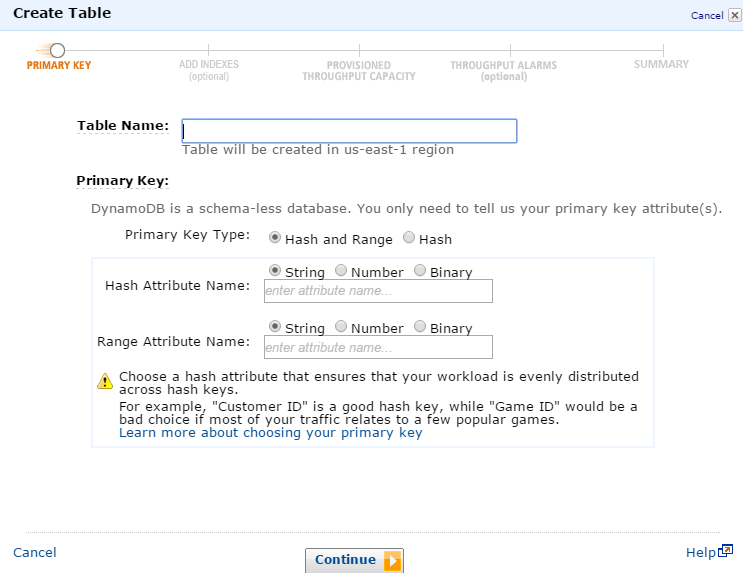 In the case of DynamoDb when you create a new database then that database will be available in the selected region. It doesn’t, however, mean that users cannot save and access records in a database in Ireland from Australia. However, it will take Australian users a bit more time to complete the DB-related operations than it does for a user in the UK. Also, we’ll see later that the region must be specified in code when configuring the access to AWS otherwise you may be wondering why your database cannot be located. In both cases you are responsible for making the IDs not-null and unique. If you in code try to enter a record whose ID already exists then that row will be updated instead with the incoming properties. The popup also gives the choice of data type: string, number or binary. 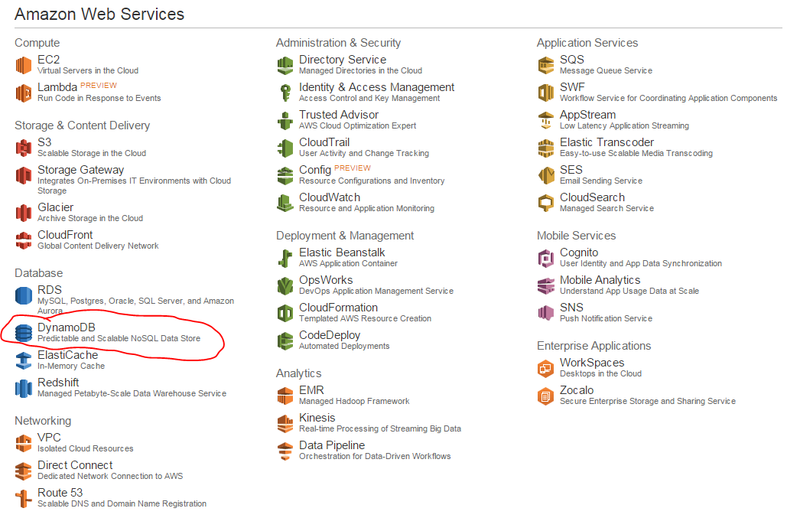 In fact, these are the three data types that are supported in DynamoDb. There are no separate int, bigint, decimal etc. types, Number takes care of all. Also, there’s no native DateTime type. If you need to store dates then you can store them as UNIX timestamps as a Number data type or as a formatted string as a String data type, e.g. “2014-04-15 13:43:32”. On the next screen you’ll be able to set up alarms in the case of those read and write units being close to the limit. Don’t worry about that now so uncheck the Use Basic Alarms option and click Continue. You can also delete a table through the Delete Table button, but let’s keep this table for the time being. We’ll extract some information about it in code in the next post. This exercise was enough to see what DynamoDb looks like. We haven’t loaded any records yet. You’ve probably noticed that we haven’t specified any column names and data types like we normally do in relational databases such as MS SQL Server. This is no surprise to those familiar with NoSql databases where column names and data types can vary from record to record. This is enough for starters. We’ll start looking at some code in the next post.